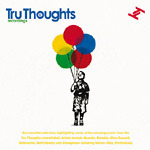 Latest Tru Thoughts compilation and very nicely priced! Bringing together some of the most popular songs on the Tru Thoughts catalog and a sprinkling of timeless instrumentals, from world-respected acts including Quantic, Bonobo, Alice Russell, Nostalgia 77, Belleruche, Hot 8 Brass Band and Stonephace (featuring the Portishead guitarist Adrian Utley), the compilation is packed with quality. Alongside these Tru Thoughts signings, past and present, you'll also find an impressive roll call of guest artists, including rising UK soul singer of the moment Andreya Triana (Ninja Tune). Once again, as with other compilations on the label this is a perfect introduction to the what they do if you haven't ever checked 'em out.